I hope everyone had a wonderful Labor Day weekend! I wasn’t too enthused with any of the sales happening over the weekend, so apologies for no sale post. If you weren’t able to locate the Refinery 29 + Old Navy feature last week, I now have a link! Click here to check out the feature, and thanks again to Jay for shooting such incredible photos! The cool, crisp weather I enjoyed in Utah this past weekend has solidified fall in my mind. My friend Rachel and I were planning out our outfits for New York Fashion week (I leave tomorrow!) and she showed me this pair of booties that she just bought, and now I’m dying for a pair. A girl after my own heart, for sure. These boots come in black, graphite gray and an oxblood shade. Rach has the black pair, but I’m tempted by the gray. What say you? Since I just bought this pair of booties, I may hold off and then purchase the Vince pair next month. Great round up, #4 is killer! LOVE these colors and picks. Sunglasses, dress and pumps are my fav. beautiful edit! Cobalt and black is such a sharp combo & I’m loving those heels! Congrats on that fab feature! Love nine and ten! So pretty! This color is fab! 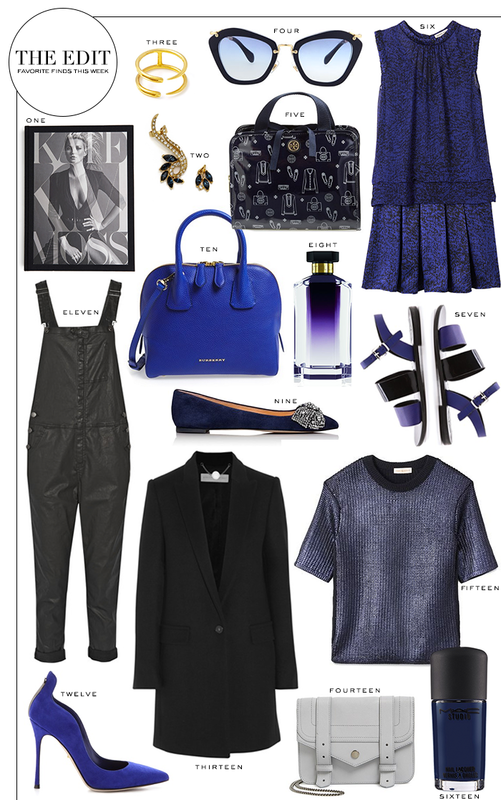 Ooh la la you’re speaking my language – Blue! I’ll take number 6, please! Navy is such a great color! It allows you to wear black without being so blunt. All the jewel tones are good picks for someone like me! I love #9 – I need some embellished flats for fall. I loved following along with your weekend on Instagram! I love this post – the blues are so beautiful and scream fall to me! And as far as those Vince boots go, I love them both…so just get both, right?! I need that Burberry satchel in my life asap! And I’ll take that gorgeous Stella McCartney coat too! Great Edit…I’ll take the shades, Stella and the coat. DYING over this blue dress! I just fell hard for that dress (no. 6)! Swoon! love love love! That Rebecca Taylor dress is amaze. I wanted that RT dress to look good on me soo badly! Those TB flats are the loveliest things! I love a blue velvet.